When I agreed to talk about the management problems at the Linux Foundation to Noam Cohen, the reporter who wrote this story on Linux for the New Yorker, I expected to wait at least a year to see any significant change in the Linux community. Instead, before the story was even published, the Linux project leader Linus Torvalds suddenly announced that he was temporarily stepping down from his leadership role. He also instituted a new code of conduct for the Linux kernel community after resisting years of requests for one. I was (and am) astonished. So is everyone else. Now that I’ve read the New Yorker story, I am even more surprised–everything in it is public knowledge. Here’s why I don’t think the story explains why he stepped down. Torvalds has been in charge of Linux for 27 years, and he’s been verbally abusive most of that time. I know, I personally spent more than 15 years struggling to change the Linux community for the better, first as a Linux kernel developer for more than 7 years, then as co-founder and executive director of a non-profit working to make things better for my fellow kernel developers. In 2016 I sent a letter to the Linux Foundation board of directors detailing pervasive mismanagement at the foundation. Nothing I or anyone else did changed the culture of Linux. I finally realized why the Linux community was enduringly toxic and resistant to change: because Torvalds likes it that way, and he can inflict millions of dollars of losses on anyone who tries to stop him. How? Well, if Torvalds’ employer, the Linux Foundation, pressures him, he can quit and they will lose millions of dollars in revenue, because paying Torvalds is the main reason sponsors give the foundation money. If a Linux Foundation sponsor tries to make Torvalds change, he can retaliate by refusing to integrate the sponsor’s code into the Linux kernel, forcing that sponsor to pay millions of dollars in software maintenance costs. If an individual Linux developer confronts Torvalds about his abusive behavior, their Linux career will end. Torvalds also fostered a cult of personality whose central tenet is that Linux will fail if Torvalds is not its leader. In this system, Torvalds has little incentive to stop doing anything he enjoys, including verbally abusing other Linux developers. 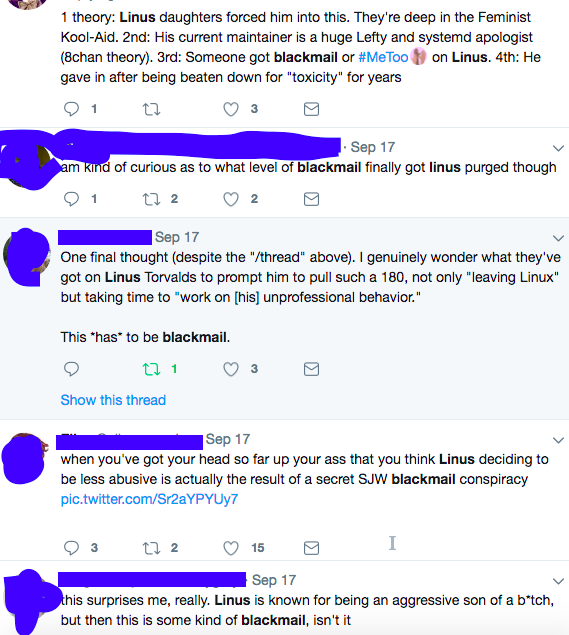 My hope was that if a news story exposed this underlying power structure and showed how Linux Foundation sponsors such as Google, Intel, and HP are paying millions of dollars to fund toxic harassment of their own employees, the sponsors would act in concert to force some change, hopefully sometime in the next year. Instead, the usually intractable Torvalds abruptly stepped down before the story was even published. I can’t think of anything I told Cohen that would result in anyone risking millions of dollars to confront Torvalds this quickly and forcefully. Maybe it’s a coincidence; when the New Yorker reached out for comment, Linux developers were also angry about another issue. It’s possible Torvalds took other developers’ feedback about his abusive behavior seriously for the first time–in 27 years. But the announcement seemed weirdly rushed even to the developers asking for change. But you know who probably does know the explanation? Senior former Linux Foundation employees, and with the recent high turnover rate at the foundation there are quite a few. Here’s what I suggest: Linux Foundation sponsors should demand that the Linux Foundation release all former employees from their non-disparagement agreements, then interview them one-on-one, without anyone currently working at the foundation present. At a minimum, the sponsors should insist on seeing a complete list of ex-employee NDAs and all funds paid to them during and after their tenure. If current Linux Foundation management balks at doing even that, well, won’t that be interesting? If you’d like to support people working to fix harmful workplace conditions, please donate to BetterBrave, which helps employees fight workplace harassment, including sexual harassment and discrimination. Thank you! If you’re being abused at work, I hope you will keep meticulous documentation, pay attention to statutes of limitation, talk to a lawyer, and reach out to a reporter sooner rather than later. As the stories about Uber, CBS, and The Weinstein Company show, many boards of directors just rubber-stamp the abuses of the CEO and upper management until someone talks to a reporter. I’m also happy to listen to your story, confidentially.